New Delhi: Shri Thaawar Chand Gehlot, Minister for Social Justice & Empowerment while addressing the “15th National Review Meeting of State Commissioners for Persons with Disabilities on Implementation of Act-1995” stressed for the need that States should create/setup separate Department of Disability Affairs with appointment of full time Independent State Commissioner in accordance with provisions of PwD Act, 1995 for effective implementation of the Act as well as welfare Programmes & Schemes of Education, Training, Skill Development and rehabilitation of the Disabled (Divyangjan) in the society. He chaired the opening session of the 2-day long National Review Meeting, which was attended by 11 States Commissioners and 15 representatives of the State Commissioners/State Government and representatives from Central Ministries and National Bodies under Ministry of Social Welfare. He stated that there is great need for empowering and strengthening the Divyangjan in the Country by safeguarding their rights and privileges entrusted by the Act. The Ministry of Social Justice & Empowerment has become an important & prominent among all Ministries of the Central Government for making all round efforts for better education, vocational training & rehabilitation of the Divyangjan in society so that could lead a respectable life. The Ministry of Social Justice & Empowerment has set up new milestone & world record in distribution of Aids & Appliances to Divyangjan, launching innovative programmes and schemes for all round development and their Socio-Economic rehabilitation in the society. The Programmes and Schemes of the Ministry have been recognised and appreciated worldwide and has become role model Ministry of Government of India. Highlighting the Provisions of New Rights of Persons with Disabilities Act, 2016, the Minister added that the categories of Disability have been increased to 21 from the Presently 7 and now the privileges and Rights of Divyangjan have been brought at Par with the developed Countries. Sh. N. S. Kang, Secretary, DEPwD in his speech stated that the States should consider to create/set up separate Department of Disability Affaire in their respective states and the State Commissioner should act as watchdog for effective implementation of Act, Programmes and Policies for Welfare of Divyangjan in State. He should ensure that 4% reservation is given to Divyangjan in all Programmes & Schemes of the State Government and local bodies. He should take initiative and be instrumental in clearing of backlog of vacancies reserved for PwD through Special Drives and Wider Publicity should be given to new Act in their State. Dr. Kamlesh Kumar Pandey, Chief Commissioner for PwDs in his address stated that State Commissioners should review the implementation of the Act at State and District level vigoursly. They should organise Mobile Courts and conduct reviews at Districts. They should organise Special Camps for issuing Disability Certificate to all Divyangjan in the State at their doorstep and should mobilise people participation in their programmes. They should also ensure timely conduct of State Coordination, Executive and advisory Committee meetings at regular intervals and promote better & larger avenues for employment and Rehabilitation of Divyangjans. He also added that State should promote Skill Development and training programmes for rehabilitation of Divyangjans in society. On this occasion the State Commissioners and Central Government Ministries made Power Point Presentations showing various measures being taken by their respective states/ministreis for effective implementation of the PwD Act, Programmes and Policies of Govt. of India for welfare of Divyangs. The Prominent Ministries were Panchayati Raj, Deptt. Of Personnel & Training, Deptt. of Revenue and Deptt. of Financial Services. The State Commissioners from J&K, North East States, Union Territories, Himanchal, Andhra Pradesh, Chhatisgarh also made presentations before the Minister. In the afternoon session today the Chief Commissioner presented the recommendations of the 2 days long meeting towards effective implementation of the Act & Programmes for welfare of Divyangjan. On this occasion Dr. Pandey also informed the State Commissioners about Proposed institution of “Annual Award for Best State Commissioner” from the year 2017-18 onwards for Extra Ordinary performance made by State Commissioner for Welfare of Divyangjans. 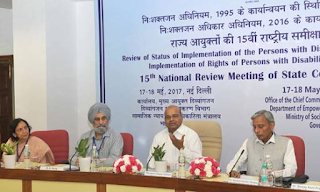 The 15th National Review Committee made 26 recommendations for effective implementation of the Rights of Persons with Disabilities Act, 2016 as well as Programmes & Schemes for the welfare of Divyangjan in the States. Persons with Disabilities on Implementation of Act-1995” stressed for the need that States should create/setup separate Department of Disability Affairs with appointment of full time Independent State Commissioner in accordance with provisions of PwD Act, 1995 for effective implementation of the Act as well as welfare Programmes & Schemes of Education, Training, Skill Development and rehabilitation of the Disabled (Divyangjan) in the society.